Electric charging stations are a crucial and important part of the mass adoption of electric cars. A few companies have joined the race for the perfect charging stations and Schneider Electric’s latest charging station extends its original use to accommodate apartment owners. When it comes to recharging electric cars, EV and plug-in hybrids, PHEV, we find more and more public charging stations popping up over the years. The caveat is that these stations are usually located in cities and have yet to make their way into apartment complex and on streets for overnight charging. Schneider Electric’s latest EVlink is heading in that direction. Extending the EVlink's Use. Apartment and tall building owners are still left behind when it comes to charging stations. The reason is that not every apartment owner has a dedicated space where they can charge and parking on the street means overnight charging is almost impossible. EVlink’s new features wants to extend the product beyond its original in-home use to indoor apartment and public parking garages. This effectively means it could answer a wider market than it was originally designed for. The new charger also goes after light commercial spaces and car dealerships, making it more appealing, more compatible and allow users options to personalize the charger. Convenience, Ease-of-Use & Compatibility. A separate cable bracket and dock offer owners versatile installation options with easy cable organization. An interesting portable plug-aside option will be available later and will offer greater charging flexibility, such as being taken from one home to another. The EVlinks is taking into consideration the growing number of EV makes and models, as well as future electric cars. It now handles locations wired for either 208 or 240 voltage. Enhanced Support Network. The company has put a lot of effort into expanding its customer support services and making its troubleshooting even better in order to easily identify and resolve potential faults. Personalization. The charger can be customized using a library of over 600 unique skin designs or owners can upload their own personal photo or image. 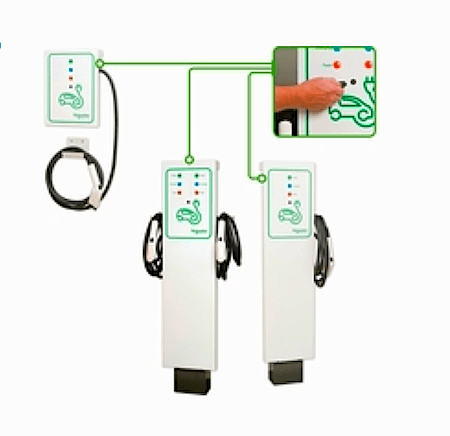 It sounds as if Schneider Electric is recognizing the dire need for a coherent charging system that meets the unanswered needs of those in apartment buildings. By extending the original range of use of its EVlink from personal to multi-use, it’s foreseeable to see units placed in apartment garage units serving many. While we are still far away from giving people who park on street the opportunity to charge overnight, Schneider Electric is using what it already has and extends its use to a wider audience. It shouldn’t be too much of a stretch at some point to see EVlinks on every street corner or dedicated electric car spots. Good idea. The one Ford is recommending for the Focus Electric (not sure of the brand, I think it's GE) is also portable and can plug into any 120V or 220V socket. It's a fairly small unit and can be taken with if you move. These are definitely a good way to go, even if you're a homeowner.